Give your guests a one-of-a-kind gift with our elegant snowflake bookmark favors to make each reading session a memory filled experience. Measuring 2" x 2" or 5 1/4" long (including the tassel) by 2" wide. 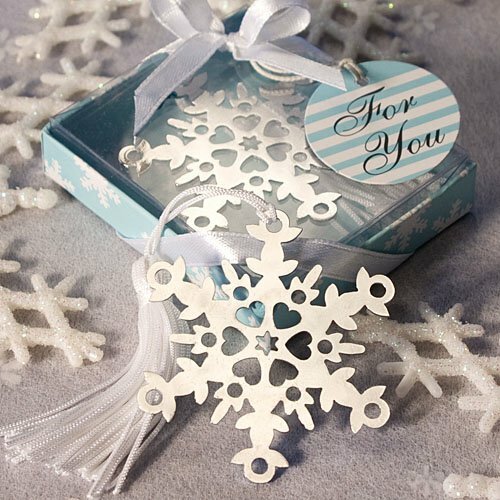 Each bookmark features a delightfully detailed silver metal snowflake page marker with an attached white tassel and comes attractively packaged in a Let It Snow Collection signature box with a winter blue/snowflake design base and clear top. We've finished it off with a white satin bow and an attached round ice blue and white striped "For You" tag.